Experience the beauty and serenity of the Pacific Northwest at this 4-bedroom, 2.5-bathroom vacation rental home in Bremerton. With views of Phinney Bay and the Olympic Mountain Range, this 2,148-square-foot home for 8 is perfect for those looking for a break from city life. 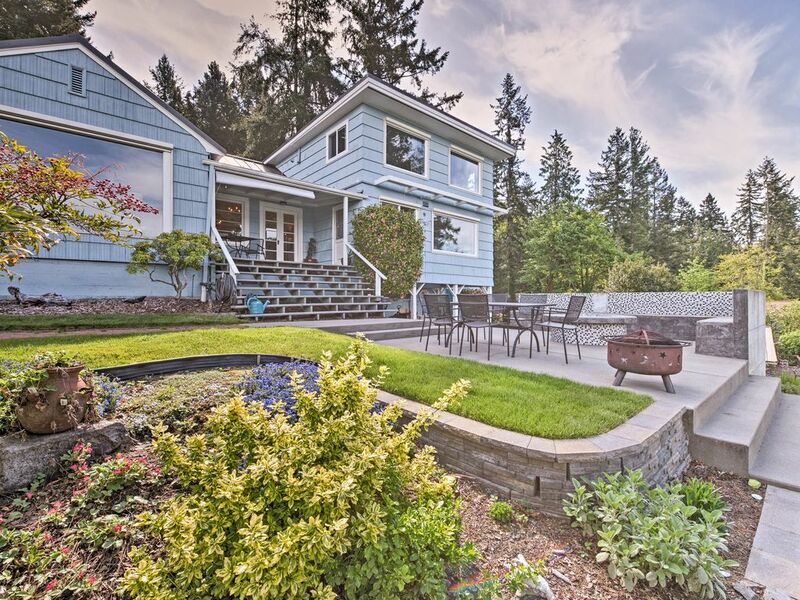 Whether you spend your days exploring Poulsbo, gathering around the fire pit, or simply marveling at the views from the patio, this newly remodeled house is sure to be the perfect home base for your Evergreen State getaway. Built in the 1940s, this spacious home has both charm and character. Explore the best of Kitsap County throughout your stay and discover unique waterfront adventures. The fully equipped kitchen, complete with stainless steel appliances, expansive countertops, and a uniquely modern feel has everything you'll need to whip up some 5-star fare. Get caught in some Pacific Northwestern rain while out on the water? Don't worry, you'll be able to eliminate your chill as you feast thanks to the dining room's gas fireplace. After dinner, head upstairs and watch Guardians of the Galaxy, starring Washington native Chris Pratt, on the flat-screen Apple TV while your group's workhorse puts their nose to the grindstone at the fully equipped work desk. The master bedroom boasts a plush queen bed and en-suite bathroom making it feel like a luxury hotel suite. Each with their own unique flair, the bedrooms feature everything from rustic shiplap walls to awe-inspiring bay views providing one-of-a-kind spaces to rest your head. Be sure to spend some time in the lavish backyard during your stay. Whether you choose to roast marshmallows on the firepit or enjoy a more hearty meal at the dining table for 8, you'll be making memories against a backdrop of towering mountains and sparkling water. Put on some sunscreen and enjoy the 100 feet of beautiful waterfront that sits just outside your door. Not only is the bay beautiful, but it provides opportunities to fish, boat, and more! When you don't feel like cooking, head 10 minutes down the road and eat like a local. With restaurants like Bremerton Bar and Grill offering outdoor dining and La Fermatas providing a beautifully romantic ambiance, you're sure to have a dining experience that you'll never forget. Spend a day exploring Poulsbo, also known as 'Little Norway.' Home to rich Scandinavian heritage and top-notch shopping, this town is rapidly turning from a tourism hotspot to sought after vacation home destination. Located less than 3 miles from the property, Rolling Hills Golf Course is a great place to show off your skills and soak up the sun. Craving a taste of city life? Head 3 miles down the road to the Seattle Ferry and adventure to the city for the day. - Amenities include a fully equipped kitchen, views of Phinney Bay, a fire pit, furnished patio, state-of-the-art appliances, a gas fireplace, wood-burning fireplace, a flat-screen Apple TV, Wii Console, movie projector, free WiFi, in-unit laundry machines, driveway parking for 4 vehicles, and more! This house is everything!!! Will definitely stay here again. Magical setting, fantastic kitchen, very comfortable place for our large group to gather and enjoy one another. Easy proximity to ferry and grocery shopping, yummy breakfast spot. Already making our plans to book again. We really enjoyed our stay. The house was beautifully furnished and clean. The kitchen was well-stocked with pots and pans. My kids loved the toys. And the view and fireplaces are lovely! Beautiful home with lots of space to spread out or gather. This house was perfect for our long weekend family get together. Coming from CA to see our daughters, 2 grandkids and parents we were so comfortable and it was such a relaxing stay. Well stocked house, plenty of space, quiet and the views are AMAZING! Would highly recommend to anyone. Also great communication. Thanks for sharing your house with us. I do recommend they address the fireplace in the den area. It is too complicated to operate. The fireplace in the kitchen is awesome! Overall all the appliances worked well. Recommend updating and upgrading the cookware. The BIG TV screen with the projector was a great surprise. The owner should take more credit for that feature. We had a great time on our girls trip! The house was beautiful and the view was amazing. We will be back!! !